Pizza or Pittsa, what Italians called it, has bowled over the whole world with bready, cheesy and spicy flavors. 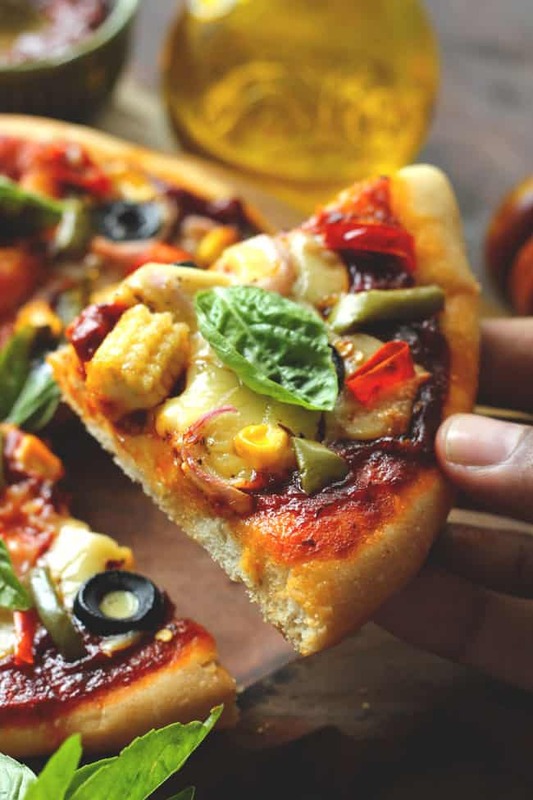 The origins of Pizza can be traced back to Romans, when they baked flatbread called Focaccia and called it Picea, yes you read it write Focaccia is the inspiration for Pizza. The modern-day Pizza has its roots in Naples, Italy and in the honor of Queen Margherita, the famous Margherita Pizza got its name. 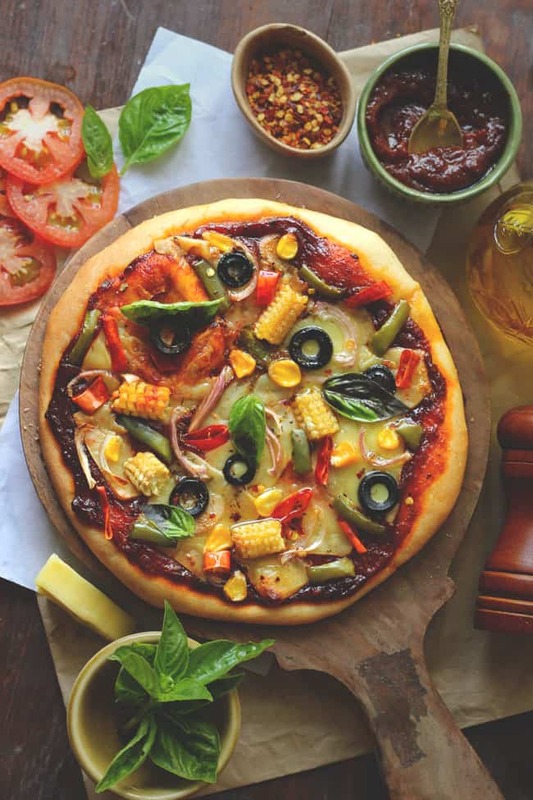 Our classic veg pizza is definitely something that can get customized as per your liking of vegetables and it is so delicious. 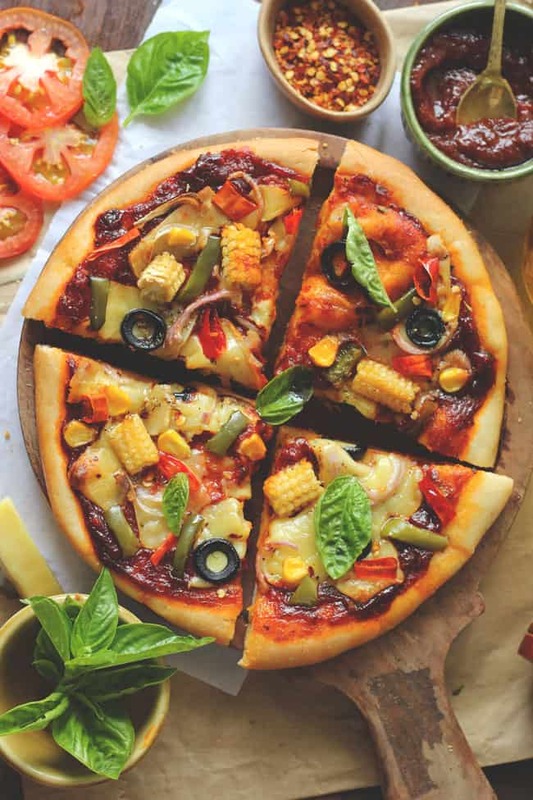 I am sure you will fall in love with this veg pizza recipe. When I bake this veg pizza at home we devour it all in one go, it is so hard to resist. Many of my friends complain that they never get the actual flavors in a homemade veg pizza. 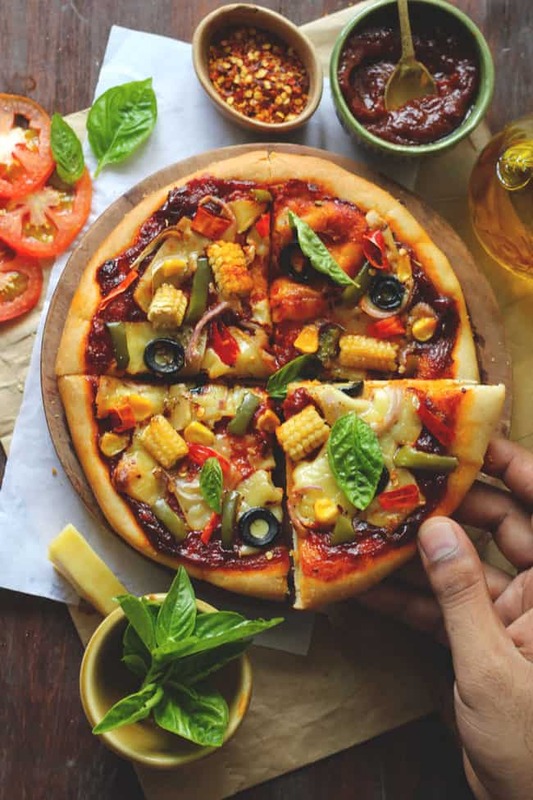 To them, I would like to suggest follow this classic veg pizza recipe and I am sure you are not going to complain ever again. This veg pizza recipe is been there in my diary from past 4+ years and it has always yielded me gratifying results. 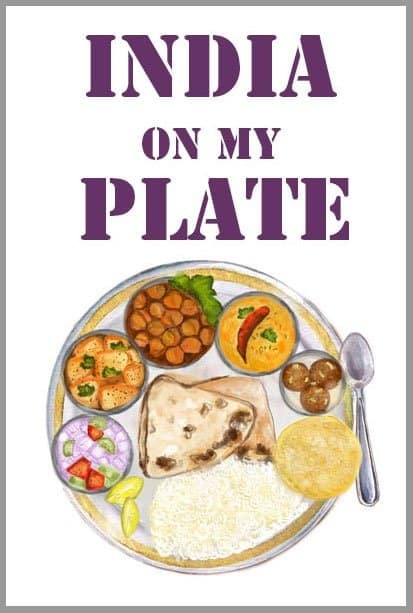 Few Italian recipes that are my all-time favorite – Whole Wheat White Sauce Pasta, Naan Pizza, and Basil Pesto Pasta. So if you thinking how to multitask while making pizza – then I have few tips for you. Prepare a large batch of pizza/pasta sauce and store it in the fridge. It remains fresh for 15 – 20 days. Secondly, while your dough is set for rising, prepare the vegetables for topping and grate the cheese. Once the dough is all set for baking all you need to do is assemble the pizza. 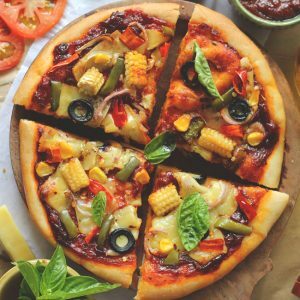 How to Make Perfect Veg Pizza at home? Kneading is the crucial step in the making of perfect pizza base. Knead the dough for 6 – 10 minutes before allowing it to rise. I prefer a dark, damp free space like inside the microwave or oven to rest the pizza dough. And these places have the right temperature to allow the perfect rising of the dough. You can always adjust the thickness of base as per your preference. It can be thick and pillowy or thin and crusty. Adjust the baking time accordingly. Tomato sauce is one of the important taste deciding factor in a homemade pizza. That is the reason I stick to homemade pizza/pasta sauce. Be generous while adding the cheese to your pizza. And stick to a good quality mozzarella/pizza cheese. This makes a hell lot of difference in the taste. Always bake your pizza on the middle rack of the oven. If baked on the top rack there is a high probability the top might get overcooked while leaving the base under-cooked. And, last but not the least, you can bake this veg pizza in the convection mode of a microwave oven. In the lukewarm water add yeast and sugar. Mix nicely. Let it sit for 5-10 mins until frothy. This means that the yeast is active. Make well in the centre of the flour mixture. Pour activated yeast. Cover it with flour and let it sit for another 5 minutes. Add the olive oil. Knead the dough by rolling it backwards and forward, using your left hand to stretch the dough toward you and your right hand to push the dough away from you at the same time. Repeat this for 10 minutes, until you have a smooth, springy, soft dough. Place the dough in a lightly greased bowl. Cover with a kitchen towel or plastic wrap and let double in size for about 45 minutes. This could take 30 minutes to 1 hour depending on the weather. I usually place it inside the oven or microwave for proofing. Divide the dough into two equal halves and again allow to double in size for 30 minutes. Grease a large baking tray with olive oil. Place the ball of dough and with fingers stretch it out by pressing, into 7-8″ diameter circle. Smear the generous amount of pizza sauce over the base of your pizzas and spread it out to the edges. Top with grated cheese. Arrange the toppings of your choice over the layer of cheese. Drizzle with a tiny bit of extra virgin olive oil and add a pinch of salt and pepper. Bake for 20 – 30 minutes. Check the pizza base for doneness. Scatter fresh basil leaves over the pizza. Sprinkle seasoning. Cut into wedges and drizzle a splash of olive oil. Serve Classic Veg Cheese Pizza warm. Pizza is comfort food for me. And your photos are making me hungry!